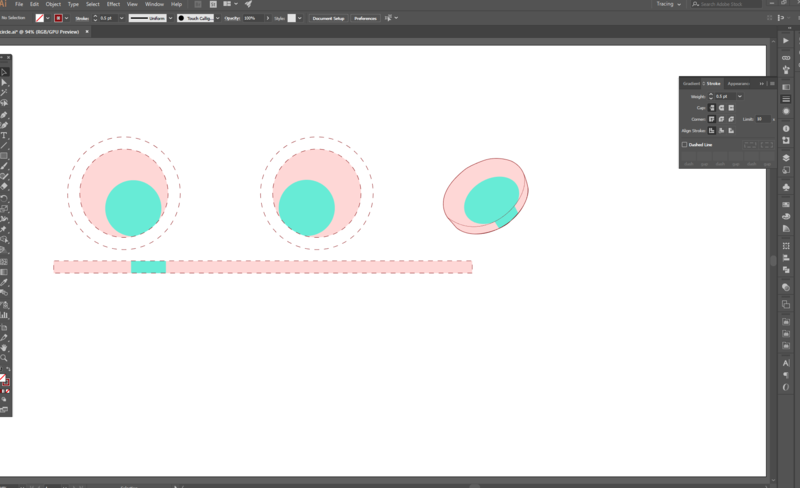 I'm trying to work out how to set up the rolling edge on a circle in Adobe Illustrator. It's for a design/pattern that will be printed on the face of a ceramic casino token, which will be wrapped around the face, along the edge and onto the reverse side. I know that the spacing needs to be different, so that the edges don't merge at the ends when wrapped around... But can this be calculated programmatically by any native tool? I'm struggling to work out the best way to do the alignment to the edges/faces. Further, the edges are very slightly curved - they aren't sharp, so what's the best way to set up my mapping of the face/edge to ensure they're joined up. Not sure what tools/features on Illustrator best support this? I would set up concentric circles showing the edge width as a circular bleed from the main design - I'd do a front and back condition, each as its own circle with circular bleed, and be sure both bleeds result in the same edge condition. To help assure your printer or manufacturer correctly understands your design intent, I'd save trimmed versions of each - front, back and edge as symbols, and apply them as "artwork" to a 3-D extrude of a circle, so they see exactly how you wish it to end up. Not the answer you're looking for? Browse other questions tagged adobe-illustrator print-design alignment or ask your own question. How to align a single letter within a text object to the edge of the bounding box in Adobe Illustrator? Illustrator: How do I use clipping mask and shape builder together? How do I convert this image into a 3D model?